You've reached a degraded version of gatorboosters.org because you're using an unsupported version of Internet Explorer. For a complete gatorboosters.org experience, please upgrade your browser. The Facilities Master Plan includes a renovation of Katie Seashole Pressly Stadium, a new ballpark for baseball and a new football stand-alone training complex. We need your help to make these projects happen. Please see below for any pertinent seasonal information regarding your membership. As a benefit of being Gator Booster Member, you can play at the Mark Bostick Golf Course for $40 (includes cart and green fee) or walk the course for only $25. Present your Gator Booster card at Proshop. Call for tee time at 352-375-4866. The University of Florida Athletic Department announced significant facility plans Friday, to include program-changing upgrades to its current softball stadium, a new baseball ballpark on the southwest part of campus, and a new stand-alone football training complex in the location of the current baseball stadium. These projects, which combined are estimated to cost $130 million, are part of phases 2 and 3 of the University Athletic Association’s Facilities Master Plan. The Tax Cuts and Jobs Act of 2017 provides that no deduction will be allowed for any amount contributed to an institution of higher education if the taxpayer receives, directly or indirectly, the right to purchase tickets for an athletic event of such institution. Therefore, there will no longer be a deduction for Gator Booster contributions that give you the right to purchase tickets after January 1, 2018. No portion of any ticket related contribution made after that date is deductible. Please consult your tax advisor. Gator Boosters assigns parking passes as a benefit to those memberships at the Scholarship Partner contribution level and above. Click on the button below for questions regarding Booster, General, Disabled, RV, and Visitor parking. GAINESVILLE, Fla. – The University Athletic Association, in the midst of one of the most comprehensive revamping of facilities in its history, has received significant support from those who once called Florida's athletic venues home. 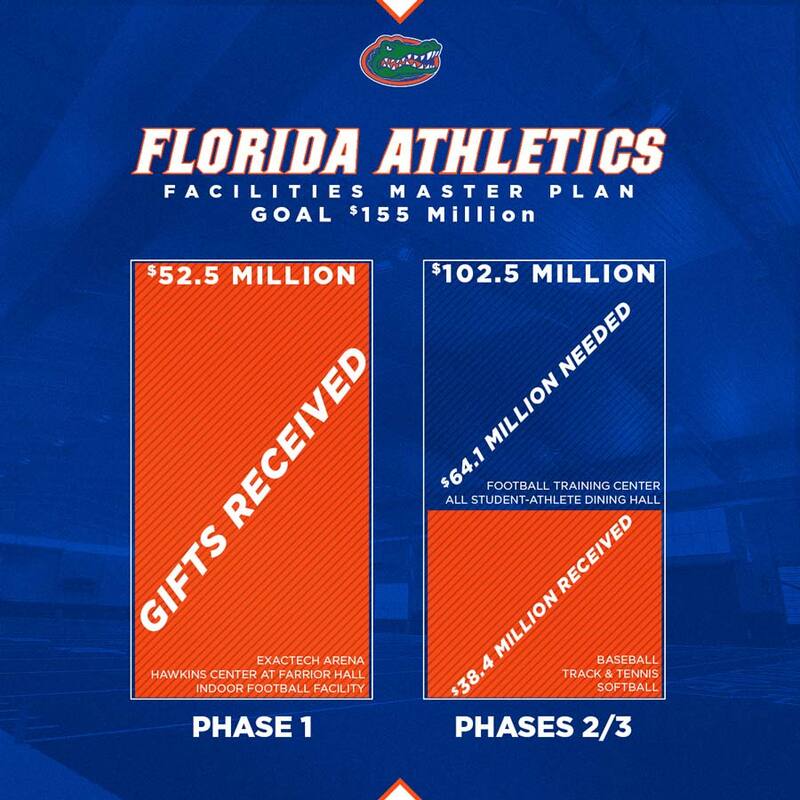 As the UAA continues a fundraising campaign for the construction of the Florida Football Training Center, a stand-alone facility to modernize and provide adequate space for the football program, and Florida Ballpark, the future home of the UF baseball team, 39 former UF student-athletes have contributed nearly $18 million of the current $90.9 million committed over the course of the three-tiered UAA Facilities Master Plan. Phase I of the project launched in 2015 with the $65 million renovation of the O'Connell Center, construction of an indoor practice facility for football and the Otis Hawkins Center for Academic and Personal Excellence at Farrior Hall. The first part of Phases II and III was the $15 million renovation of Katie Seashole Pressly Stadium, home to UF's two-time national champion softball team. The Gators moved into their state-of-the-art facility last month. 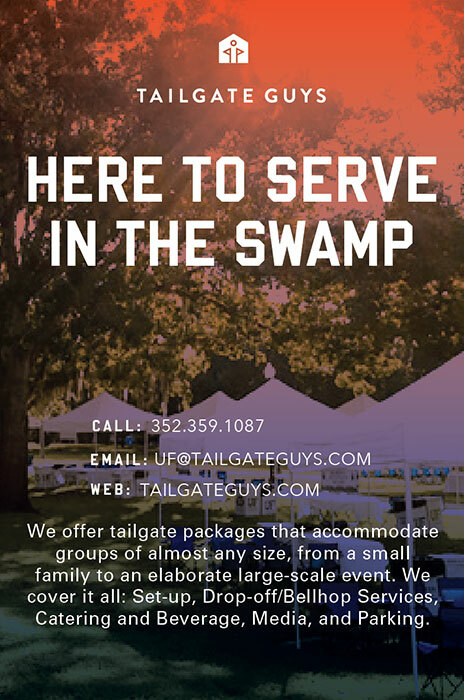 A term synonymous with the biggest and baddest Gators in the Swamp, our Bull Gator program is comprised of an elite group of individuals and businesses, from all over the country, who have one common bond – a love of Gator Athletics and a desire to support the program at the highest level. Membership requires an annual contribution of $16k or more. The John J. Tigert Society is our stewardship program designed to recognize the lifetime contributions of our major gift donors by providing meaningful engagement opportunities throughout their lifetime. John J. Tigert served as the University of Florida's fourth president from 1928-1947 and is known for making a major impact on the landscape of intercollegiate athletics by establishing the grant-in-aid concept which is the basis for today's athletic scholarships. He was responsible for the construction of Florida Field and helped create the Southeastern Conference. President Tigert left a lasting legacy for Gator Athletics and we find it fitting to use the Tigert name for the society that honors the legacy that each of our major gift donors leave on our program. Gifts of any size make an impact on our student-athletes. Whether you are a current season ticket holder and you would like to take part in the Game Changer Initiative in addition to your tickets, or if you are Gator fan elsewhere in the country or around the globe. No matter your current level of involvement, this is your opportunity to make a difference and we need your support!